Our Speaker for our November 4th meeting will be Bob Cummings. The meeting will be hosted in Room 101, Casa Del Prado in Balboa Park. His talk is titled “Red Amanitas, Black Trumpets, & White Porcini, Mushroom Hunting in Santa Barbara.” He is going to meet us at the Blue Water Grill at 5 PM on the 4th as well as come to our member foray. Foray announcement will be sent to active members through the list serv. Bob Cummings has been a Professor of Biology at Santa Barbara City College since 1973, teaching mostly Plant Biology for the biology major series and general botany for non-majors. He came to Santa Barbara from the Los Angeles area to attend UCSB in the 1960s as a botany major. He took Professor Ian Ross’ mycology course in 1966 and became Ian’s first graduate student at UCSB. Bob’s doctoral research project was tracking chemical changes at the cell surface of slime mold amoebae as populations grew and prepared for fusion to initiate the diploid phase of the life cycle. He also found time away from the lab bench for frequent mushroom forays and photography. He got his PhD in 1975, and by then had already begun teaching at Santa Barbara City College. 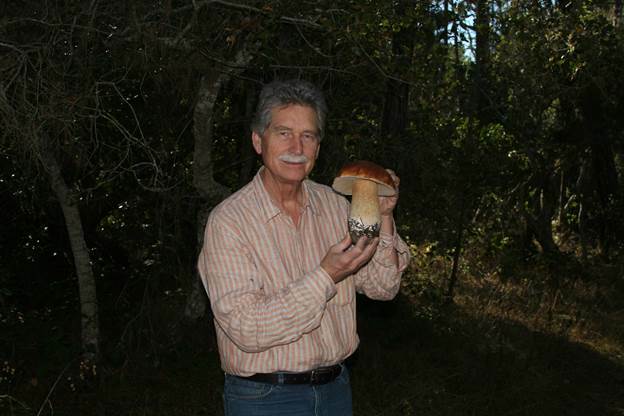 Bob has been collecting, keying, photographing, eating, and teaching about mushrooms in Santa Barbara since the 1960s. Since he does not teach a mycology course, he considers himself a sophisticated amateur student of the fungi. Over the years, he has built up a large collection of photographs and a modest herbarium of specimens from the Santa Barbara area for taxonomic reference. Bob has worked closely with local emergency room physicians at Cottage and Goleta Valley Hospitals on mushroom poisoning cases for many years. He is a frequent speaker and foray leader for such groups as the SB Botanic Garden, SB Museum of Natural History, SLOW Food of Santa Barbara, and the Los Angeles Mycological Society. He lives in Montecito with his wife, Lynne, also a teacher (and bird-watcher), and daughter Carly.